Bake cake according to package directions. Cool completely, then crumble cake in a large bowl. Add frosting and stir together or mix together with your hands until fully incorporated. Line two rimmed baking sheets with wax paper. 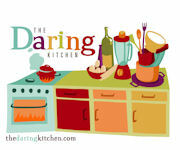 Roll 1-tablespoon portions of cake-frosting mix into balls and place on baking sheets. Freeze for at least two hours. Melt the Candiquick in a double boiler. (You may want to work with one package or a half package at a time.) 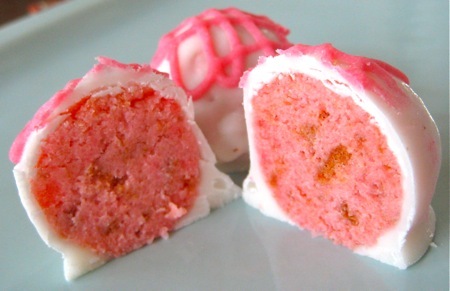 Pull about a dozen cake balls from the freezer and let them thaw slightly (five minutes). (If you dip them straight from the freezer, the coating may crack.) Just before you begin dipping the first dozen cake balls, pull another dozen from the freezer so they can thaw briefly while you dip the first dozen. Continue this cycle until all of the cake balls are dipped. Place dipped cake balls on wax paper to set. I used Pillsbury Strawberry Moist Supreme cake mix and followed the high-altitude baking instructions. I typically prefer Duncan Hines cake mix, but SuperTarget didn’t have Duncan Hines in strawberry. I used Duncan Hines Strawberry Cream frosting. I used a 1-tablespoon scoop from Sur La Table to portion out my cake balls. I then rolled them in my hands to round them out a bit. To dip the cake balls in the Candiquick, I fashioned my own candy-dipping fork by breaking the two center tines out of a plastic fork. I placed each cake ball in the melted Candiquick, used a spatula to cover the cake ball, and then gently lifted the covered cake ball out of the coating with my fork. I tapped the fork a few times gently on the side of the bowl to remove any excess chocolate and then placed the dipped cake balls on wax paper to set. I found that, regardless of my best efforts, it was nearly impossible to create an even, gorgeous coating on my dipped cake balls. This is precisely why I drizzled the pink white chocolate on top. I think it hid any imperfections nicely and also hinted at the pink center of the cake balls. I was able to coat only half of my cake balls because I ran out of Candiquick; I thought I would need only one package. I had more surface area to cover since I made mine pretty small. If you make larger cake balls, you may be able to get away with only one package of the coating (but you also may need to freeze them longer for them to hold together well when dipping them). I was in too much of a hurry to photograph the cake balls before the party, so these are the only two that were left. They were a hit! These were a great success! My party guests loved them (as did I), and they were an adorable addition to the buffet. I love that the recipe is so simple, and the flavor possibilities are practically endless with all of the different cakes and frostings that are available. I’ll definitely make these (or some variation of them) again sometime soon. The first time I saw cake balls was several years ago at a wedding and now they are all the rage. I’m tempted but would need an event and would like to know the secret of not having that flat edge. Most I’ve seen are on sticks…I wonder if it helps if they are not allowed to sit flat while drying? I think the sticks do help. There’s apparently some technique with the sticks where you need to dip them straight up and down and then flip them. The Candiquick sets much faster than chocolate, so I don’t think it would run down the stick. They taste so good that it would probably be worth an experiment. I’ve been threatening to give these a try for sometime now too. I’m with you on the Duncan Hines mixes, they are my favorite but my trusted America’s Test Kitchen loved Betty Crocker, so I gave them a try and I still love DH. I love the pink drizzle. If I would have seen these sooner I would have made some for my daughter’s 21st birthday party. Oh well, maybe for her 22nd. These are SO ADORABLE! I’ve actually never had a cake ball…I really need to get on that! Can you use this same recipe for cake pops?